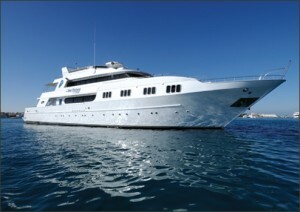 Home » Scuba Diving » What’s a Liveaboard Dive Boat? 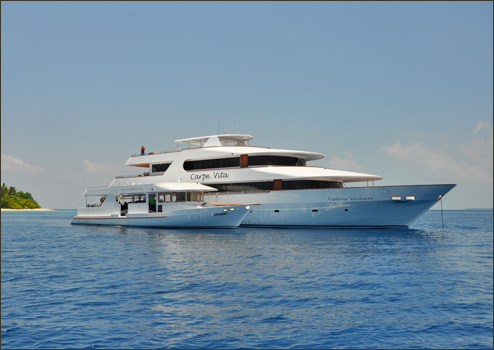 Liveaboard boats offer travelers the ultimate diving experience. A scuba diving vacation combines first class accommodations on a liveaboard dive boat with the thrill of deep dives in crystalline waters to see and experience amazing marine life up close. Whether you are a seasoned traveler proficient at diving or the once-a-year vacationer who has always dreamed of taking a scuba tour, your trip of a lifetime beckons. There is no better way to explore and enjoy diverse and remote diving destinations and unforgettable natural beauty than from the comfort, safety, and convenience of a liveaboard dive boat. Expert crews will transport you in style to where the marine life is: south along the Pacific coast to warm water dive sites such as the islands of Socorro and Guadalupe, Clipperton Atoll, or Baja California. Other popular warm water dive spots include the Caribbean, Turks & Caicos, Fiji, and a host of other sites around the globe. Some divers travel north to cold water dive destinations such as Alaska and British Columbia. Experienced divers know the right liveaboard boat dive tour will satisfy their need for adventure at every turn, starting with the plant and animal life they will observe. As a rule, shark encounters at Guadalupe Island occur best on their terms. 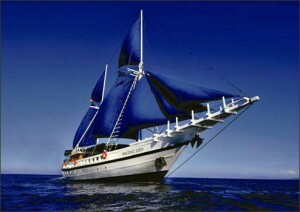 You will thrill to the adventure of descending 125’ in a dive cage to observe great whites in crystal clear blue waters. Experienced divemasters accompany you on each dive both to indicate approaching sharks and also ensure your safety. In the deep, sharks are ever-present; here they are relaxed, curious, and very likely to come quite close to your cage. Your heart will pound. Get intimate with giant Pacific mantas, whose fins span 5-6 meters. Performing their graceful acrobatics, these mantas will come out and play to swim alongside you at very close range. Not to be outdone, watch as bottlenose dolphins mimic the behavior of the giant mantas! While not as edgy as diving with sharks or swimming with giant mantas, equally impressive and beautiful is the unique kelp forest diving experience of San Benitos Island. Not only will you experience the feeling of swimming through a dense jungle in clear blue water, you will also observe curious, playful harbor seals, sea lions, and other amazing sea life. Other dive adventures offer pristine coral reefs, awe-inspiring schools of hammerhead sharks, and other dazzling assortments of sea, air, and land life. Perhaps you will let your imagination take you back in time as you dive to explore famous ship wrecks. Liveaboard boat trips in northern waters afford guests the opportunity to climb onto icebergs, observe the bubble net feeding routine of humpback whales, and dive in waters replete with Steller sea lions and giant octopuses. Enormous grizzly bears and soaring eagles alike will thrill you in their natural habitats. Now that you have a feel for some of the marine adventures available to experience on scuba diving trips, you should also get to know what liveaboard life is like. When not diving, snorkeling, or kayaking in sea exploration, you will be aboard ship. Liveaboard dive trips come in all shapes and sizes, and can last from a matter of days to several weeks or more. Ships vary in length, accommodations, and the facilities they offer. There is a liveaboard diving trip available to fit virtually every budget. If you prefer to travel with an intimate group, you may want to stay aboard a ship that accommodates just 10-12 passengers. Larger ships have capacity for as many as 28 passengers. Space onboard ship, however, is limited, so passengers should travel as lightly as possible. They will not need a huge suitcase full of clothes since much of their time will be dedicated to scuba diving. It is important to note, however, that living on a boat, even if just for a few days, is not necessarily for everyone. In spite of the latest technological and construction advances, the fact remains that ships are out on the open sea and they will rock, potentially causing seasickness among passengers. And for those people who enjoy the freedom to move about and come and go as they please, when not diving, guests are clearly limited to the confines of their ship. A truly dedicated liveaboard dive trip is not like a cruise that stops in ports and lets passengers disembark to walk around town and do shopping or other sightseeing.